Gather in Richmond - hotel to be announced. Eagleriders location is http://richmond.eaglerider.com. The first official day of the 2009 ride will start bright and early on the morning of July 31st, with a proclamation from the office of Governor of Virginia, and a blessing by the Native American tribal chiefs of Virginia. We'll begin by the ride itself by looping out towards the Virginia coastline and back to Richmond. The first settlement in the US will be a feature of today's ride, along with a special event just for us at Colonial Williamsburg, and a tour of the Yorktown battlefield. We leave the Richmond hotel at 9 a.m., head east down Rt 5 to Rt 614 to Jamestown. After touring Jamestown settlement, we'll take Rt. 132 to Colonial Williamsburg, where we'll get a taste of how live was lived pre-Harleys. After Williamsburg, we'll take the Colonial Parkway along the water to historic Yorktown, where Cornwallis surrendered to General Washington. After a tour of the site, we'll return to Richmond via Rt. 60. "Kickstands up!" at the early hour of 7 a.m. Today's ride has the earliest start due to the nature of the ride itself, with many slow curves along the Blue Ridge Parkway. Not to worry if you're a late sleeper... this year we have 2 support vans, and I suspect the Canadian contingent will be getting a later start in their hopped-up van-mobile. 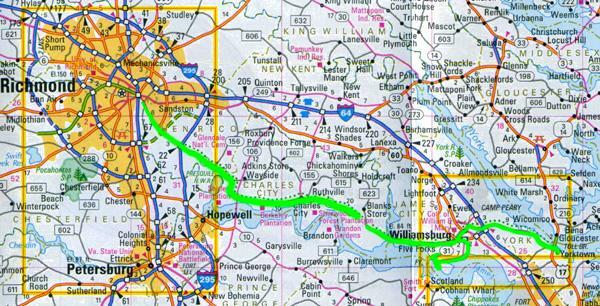 Leaving Richmond on I-64 west, we'll ride to Solomon's Store, where we'll turn north onto Hwy 15. When 15 merges with 231 North, we'll take 231 to Sperryville, then 211 west to Luray Caverns. We'll spend about 2 1/2 hours exploring the Eastern U.S.'s largest and most popular caverns. While individual tickets are $19 each, we will be working to secure a group rate. After touring the caverns and the antique car museum, we'll have lunch in the town of Luray, then jump onto Skyline Drive and head south. The fee to ride the Skyline Drive through the Shenandoah National Forest is $10.00. We'll ride Skyline drive for 65 miles, until it ends and the Blue Ridge Parkway begins. We'll arrange a meet- up at the junction of Skyline and Blue Ridge, as there are many many photo ops and turn-outs available on the Skyline Drive. Speed limit is 35 mph, and everyone should ride at his or her own pace, so we'll regroup or check in around 2 pm and then head south on the Blue Ridge Parkway for another 125 miles to Roanoke Virginia, where we'll spend the night. "Kickstands up!" at 8 a.m. Route is south on Hwy 221 to Galax, Virginia. We'll turn onto Hwy 58 west just above Galax, riding until we get to the Mount Rogers/ Grayson Highlands area, where we'll peel off and explore. Back onto 58 after Konarock, we'll cruise into Abingdon Virginia around 1 pm for a lunch, tour, and show provided by The Barter Theatre, which is the State Theatre of Virginia. After the Sunday matinee, we'll head south to Bristol, where Bro' Moe's parents will host us for the evening meal. Kickstands up at 9 a.m. We'll leave Bristol via Hwy 421 south, through Shady Valley, where we'll stop at the store and enjoy some of the 489 curves within 12 miles of the crossroads. We'll continue on through Mountain City, TN, and just into NC, where we'll turn east onto Highway 88. We'll enjoy the twisties and the backroads over Meat Camp and up to Snake Mountain, then we'll drop back down into Deep Gap and climb back onto the Blue Ridge Parkway, riding over to Blowing Rock for lunch. After lunch, we'll take Hwy 221 south to Grandfather Mountain for a couple of hours of exploring and photos along the 5900'+ ridges. Grandfather Mountain is the only private park in the world listed by the United Nations as an International Biosphere Reserve. After Grandfather Mountain, we'll continue on the Parkway over the Linn Cove Viaduct and down to Linville Falls, for more hiking, photos and even swimming if you're up for the frigid mountain streams. We'll be at Linville Falls from about 3:30 to 5:30. After that we'll take backroads to Lenoir via Jonas Ridge, then take Hwy 321 back up the mountain to Blowing Rock and dinner. After dinner, it's off to Boone (8 miles) for bed. We'll leave Boone at 9 a.m., head south on Hwy 105 to the Valle Crucis turn off, and visit the historic Mast General Store. After the Mast Store, we'll take Hwy 194 (Valle Mountain Road) up and over the crest of the mountain through Banner Elk, and then on to Elk Park. After Elk Park, we'll ride up to Roan Mountain and then back down to Elizabethton and Johnson City, where we'll have lunch. 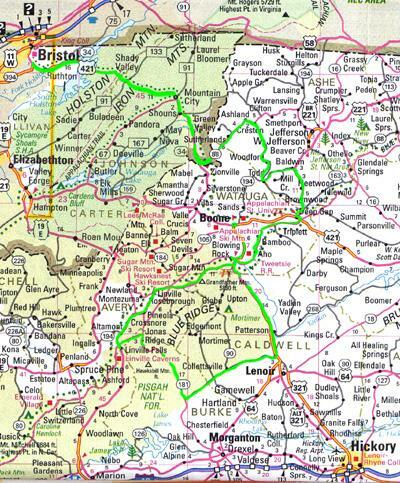 After lunch, we'll take 181/I-26 to Gate City Virginia, then head on over to Cumberland Gap, the Pinnacle (see 3 states at once), and then on to Cumberland Falls, KY by way of 25-E, 25-S, and 25-W (south)... then Hwy 90. We'll either stay in Cumberland Falls at the lodge, or in Corbin KY. Those who wish to see the world's only predictable "moonbow" can load into the vans or back on the bikes for a trip to the Falls at 11:30 that night. Leave Cumberland area at 9 a.m., heading south on 25W. We'll stop in Jellico, TN at the drive-through beer store with the beer spigot on the side of the building just so Rob can buy a gallon of beer in his own jug for 5.75. Moe swears that if you're really nice to the guy, he'll give you plastic cups so you can drink on the way... 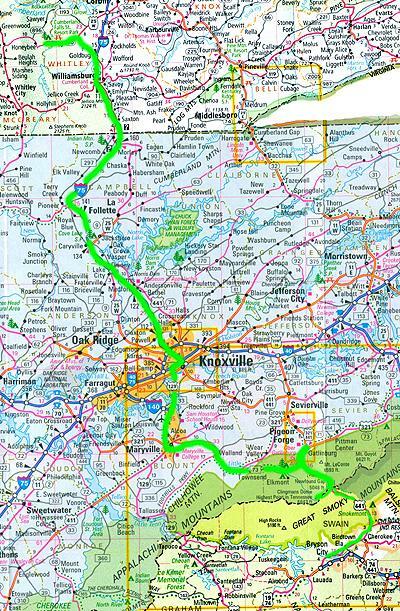 Anyway, we'll ride 25W and I-75 south to Knoxville, TN, then get onto Hwy 129 south to Maryville. 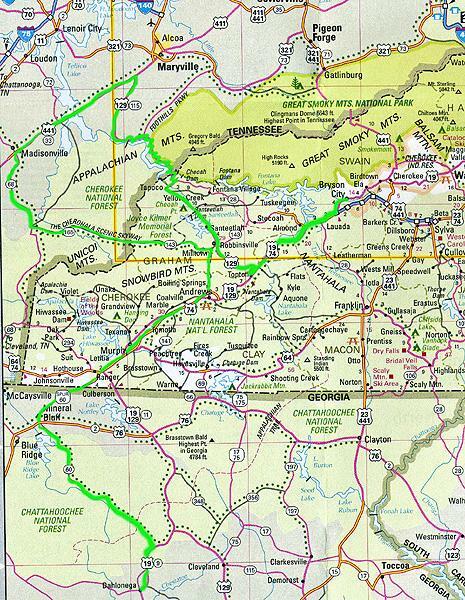 We'll fortify with a heavy snack at Maryville, and then ride into Cades Cove via Hwy's 321 and 73. Cades Cove is a still-standing settlement from the early 1800's that is right in the middle of a half-million acre forest in the Smokey Mountains. That 1/2 million acres contains 95% of the remaining old-growth trees in the eastern United States. 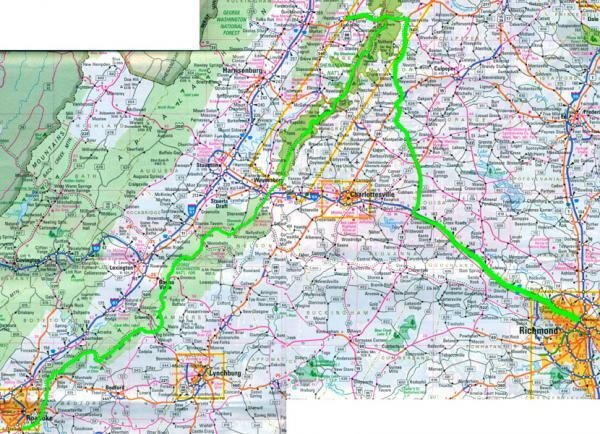 The entire loop from Maryville through Cades Cove is 35 miles, so there will be plenty of time for hiking and photos. After we leave Cades Cove, we'll meander over to Gatlinburg for lunch, then head back into the national forest for a visit to Clingman's Dome and Mingus Mill. After that we'll head down Hwy 441 into North Carolina, arriving in Cherokee around 5 pm. We'll stay in Bryson City that night, which is only 10 minutes away down Hwy 19, so those who are feeling lucky can head to the Cherokee/Harrah's Casino and meet up with us later. There are also several good loops available which lead out and back from the Cherokee/Bryson City area. Leaving Bryson City at 9 a.m., the group will head south on Hwy 19 to Topton, where we'll turn west onto Hwy 129 towards Robbinsville NC and The Dragon's Tail. Be careful! Stay in your lane and ride within your abilities! There are 318 curves in 11 miles on "The Dragon", and any one of them can bite you to the bone... The speed limit is 30mph, and the Tennessee Highway Patrol enforces it religiously. Tractor-trailers drive this road, and cross the center line with reckless abandon. Have I scared you yet? Good! Pay attention! After we ride the Dragon, we'll head over to 441 south, ride to Madisonville, then take Hwy 68 east to Tellico Plains, where we'll have lunch. After lunch, we'll head across the Cherohala Skyway to Milltown, and from there we'll head south through Murphy and on to Dahlonega Georgia. There are several scenic loops available before and after Dahlonega, and there are several local things to do in the town which marks the spot of America's first Gold Rush. There's everything from gold museums to panning for gold at the nation's last operating crush mine.